Ibrahim did not like my whiteboard note. Of course he did not. It’s too spot on. And could cause a world of trouble for ATP if I keep it up. Here’s what he said. Of course, I’m bullshitting. I know fine well that Ibrahim is blaming us and that he is utterly two-faced and thinks we are all idiots. I know he has convinced Ahmed that everything is all our fault – which is not so difficult because Ahmed wants someone to blame and it is easier to blame us than ATG (Ahmed never shows any loyalty, no doubt because he has none). According to ATP, we cause problems by not following ATP’s procedure (not true), but they’re the ones that keep taking quotes and contractors away from us. Like the scaffolding: Seven and a half weeks we have been waiting for this to turn up while ATP refuses to tell us what is going on. Meantime, every time we ask where it is, we get the same vague answer, “It’s being dealt with.” Right, like that takes seven and a half weeks. Meantime we can do nothing to get the sets built. Scaffolding? “I promise that will arrive today or tomorrow.” Oh wait, that was his promise yesterday, the day before, the day before, and last week. And it still has not arrived. I’ve been trying to avoid saying or thinking it, but I think we’ve reached the point where I have to accept that we will never film in Qatar. If anywhere at all. It’s been six weeks (around Sept 19th) since we first presented quotes to ATP for scaffolding so we could begin work on the caves and rocket launch control room. And after all that time we still do not have any scaffolding. Last Wednesday morning, I called a meeting between Production and the Art Dept to ask why no-one seemed to agree on who was responsible for sorting out the scaffolding. At the time, I was being told that Azmi was saying Hamad was doing it and Hamad was saying that Azmi was doing it. Hamad said it was not his job because he is not an expert on scaffolding and that that was the Art Dept’s job. At which point, Jude informed us that scaffolding had been bought from a company we had not recommended. I asked for confirmation they would be providing what we had asked for but she could not do that. Hamad then tried to justify it being bought without the Art Dept being consulted, to which I pointed out that he had just said the Art Dept was the experts so why was he justifying Production buying scaffolding without our input? Expressing concern that we had no way of knowing what had been ordered, I asked for the supplier’s list. After three days I still did not have it. Instead, I got the list they used to buy it — a list that had been confirmed to be out-of-date weeks earlier; a list that did not list all the individual components needed because it was based upon detailed conversations between the Construction Dept and another contractor. Put it another way, Production had fucked up once again. 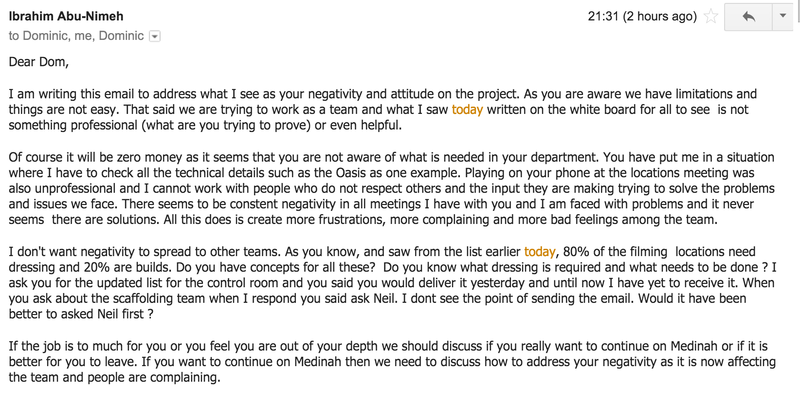 Ibrahim then emailed me asking why the Art Dept was causing problems. Antony pointed out to Ibrahim that we were trying to prevent problems. Ibrahim said we should wait until the scaffolding arrives and then see if anything was missing and that, if it was, he would buy or hire replacement scaffolding immediately. And that is what it has been like for the last seven and a half weeks. A lot has happened. Then again, it has not. Chris quit. Smithers quit. Andrew quit. Someone new called Terry Royce started. And not long after, he quit. We moved offices. I got promoted to designer. And I haven’t been paid properly since. The Art Dept recruited a whole load more new staff, but no money has been forthcoming to build anything. Weeks have gone by. We are still no closer to shooting anything. What more can I say? 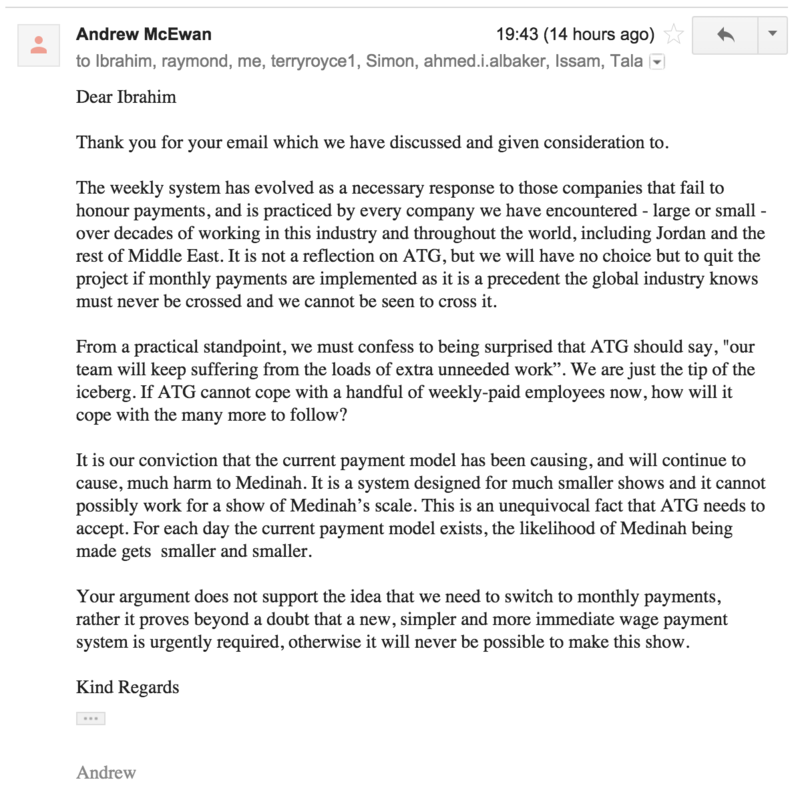 For one thing, I just wrote an email to Jude, Antony and Ibrahim refusing to communicate with the production until my wages are paid up. But more on that, and everything else, tomorrow. It’s been another ‘fun’ week at ATG. Talal visited last week, and while he seemed to be at a bit of a loss as to what to do, looking like a lost schoolboy, his presence still caused its own fair share of chaos. After three weeks of atrocious Wi-Fi in the office, Talal instructed the runners to go and buy a 4G mobile internet modem. Our pleasant surprise was short lived. After half an hour of actual proper Internet access, we suddenly lost access when Talal had the password changed (unannounced) so only he could use it. But on the plus side, we got paid on time, no doubt the result of Talal not wanting to sit with a group of people pissed off at not being paid wages. 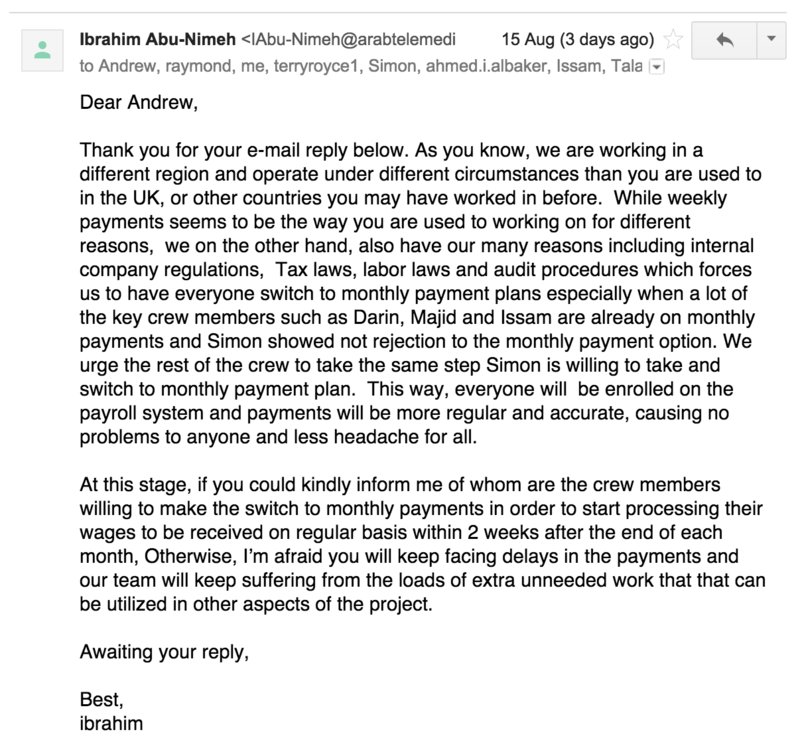 This also meant that Andrew’s reply (sent while Talal was with us) to Ibrahim’s email encouraging us to accept monthly wages was met with an extremely brief, inarticulate, and equally ambiguous reply from Talal. Somehow, I doubt Talal’s email will be the end of the matter. And indeed, Terry’s email to Jude this afternoon, reminding her that our wages are supposed to be paid today, was met with an unsurprising silence. On Thursday evening, I was dragged out on a recce to the hangar with Talal, Majid, Issam and Ahmed. When it became apparent that using the actual hangar as an office was a ridiculous idea, Talal proposed that we go to Katara village (where Ahmed has an office), and that we aim to get some office space there. For a moment, as we were sitting with the manager of the entire Katara Village facility and a rather lengthy conversation took place in Aramaic, I actually thought Talal was asking to rent an office. But as we left, I discovered that Talal had in fact been trying to blag an office for free on this $50 million production!!! As a result, we were offered the use of the unused canteen — an area that included a corridor through which people traipsed on a constant basis. Talal then took us for dinner. Conversation fluctuated between animated Aramaic conversation and awkward silence. When it came time to pay the bill, the waiter handed it to Talal who promptly shoved it towards Majid so that he could pay out of the show’s budget. The food was good though, and we eventually left. The other bizarre thing that happened was that after a few days of listening to Issam and Ahmed talk naively about hiring production designers like Gavin Bouquet (Star Wars) and Stuart Craig (multi-Academy award-winning designer whose credits include Harry Potter movies), Talal decided that we did not need a designer since Chris had already designed the show. Well, never mind the fact that only about 5% had been designed and none of it locked! It cannot be overstated what a moronic thing this is to say. Aside from the fact that not all of the sets have been designed, a designer is needed to see the designs through to completion of their construction. And let’s not get onto supervising design during the shoot! I can only assume that they do not want a designer because that way the art department has no real authority. And given that we have been such a nuisance with our constant requests to buy props, dressing and materials and crew to build sets and so on, (you know, the kind of stuff that a show usually has), well, who can blame them? Today there was a new development. This morning Bob emailed me to tell me that he had sent an email to ATG informing them that he had contacted a barrister who has told him that ATG has repeatedly been in breach of contract due to its failure to pay his wages on time, its failure to pay his last few weeks wages, and also that they had doctored his contract and gotten him to sign it under duress, and because of this if they do not pay him the rest of the money that he is owed by the end of this Wednesday the copyright of all his work will revert to him. They’re so stupid they may not pay. Today, when I proposed to ATG that we hire the construction manager I had found if we were not getting a designer yet, it was suggested to me that maybe I could be the production designer, the art director and the construction manager! It would be funny if it weren’t so ridiculous. Needless to say, my answer was brief and it was a very short conversation…. The last thing to happen today, Ahmed emailed me saying that he would like to talk about how some of the old designs were no good. He asked me if he should give me his notes on the set or give them to the new designer once one had been appointed. Clearly, he does not know that they do not intend appointing one. Or were they lying to me (I actually found out through Bob as they did not even bother to tell me), when they said they were not going to get one? And if so, why…? Since I never signed a contract with Arab Telemedia AND I’m owed money, the hi-lighted text above (bold and italics) would mean that all work done by me on Medinah remains my property. As such, ANY attempt by the show’s owner’s to sell or broadcast it shall be illegal and subject to a potential major lawsuit by me. A few things have happened this week. All interlinked. Some good. Sort of. In a nutshell, ATG really did not think this through. It doesn’t surprise me. As manipulative as they are, they aren’t very smart. They clearly did not realise the real meaning of what they were writing. 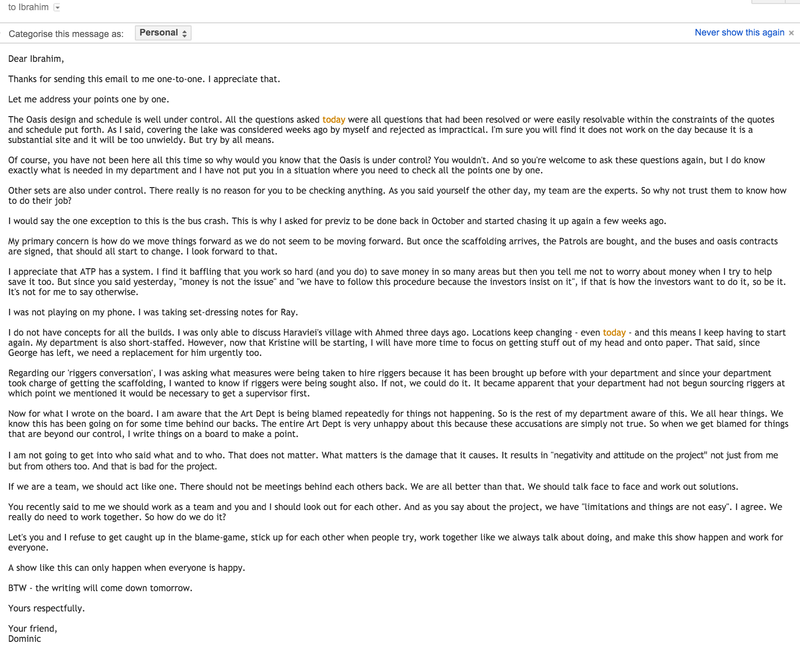 But there was another element to the email that made ATG’s position even weaker. SIMON NEVER AGREED TO MONTHLY PAYMENTS AND HE WAS OUTRAGED. To explain, Simon got a call from Ibrahim the night the email was to be sent. Ibrahim told Simon about the above email and asked Simon to say that he had agreed to monthly payments so it could go in the email. Simon said absolutely not. Ibrahim said something like, “Come on Simon. Help us out here.” Simon refused. Ibrahim push the matter but Simon continued to refuse. Ibrahim then said it was too late, the email had already been sent, and laughed! Simon was furious. So Simon then sent out an email of his own. After which, he started getting calls from Talal and Ibrahim giving him an earful about how it was not their fault (! ), and he was just being difficult!!! This, of course, undermined their entire email. But this email had another unexpected benefit — it was written by Issam, a fact we all knew because Ibrahim can barely string a sentence together in English and the writing was too masculine to have been written by Jude, so when we sat down with Issam and started to ‘joke’ about who it must have been written by, as much as Issam denied it, will all knew it was true. In fact, he looked very down. Afterwards, I learnt from a third party just how much Issam is in trouble. He is owed over $40,000 by ATG. Further, in order to live in Qatar (which he does because his wife has a job here), he required a sponsor and that sponsor is Ahmed, the series creator. As Issam’s sponsor, Ahmed can prevent Issam from leaving the country. And since Ahmed and ATG are at loggerheads, Issam is caught in an impossible position. I now realise Issam does what he does because he has no choice. He does exactly what ATG tells him because he knows they will not pay him if he does not. Essentially, they are blackmailing him. Meantime, he has to somehow appease his sponsor, Ahmed. His situation is impossible. It reflects poorly on Ahmed that, as Issam’s sponsor, Issam should never have been out in this position in the first place. Issam is the Line Producer. He is supposed to look after the investors’ interests. But he cannot because he is paid by the production company, ATG. It is a massive conflict of interest and the Qatari’s were beyond naive to have pout Issam in this position. On an aside, Talal arrived yesterday. Apparently, his trip was planned before Chris quit. Although he was giving Simon an earful the night before about not agreeing to lie and say he approved monthly payments, he arrived looking like a pussycat. He said nothing about ATG’s email. He spent the day sitting with us, joking, suggesting to Ahmed that we move all interior locations and sets to Pinewood (which Ahmed flatly refused), and he bought a 4G router. We all thought the router was for us because we had said the internet here was lousy. But one hour later, none of us could use it. Talal had changed the password so only he could use it! In his defence, it had stopped working because too may of us were using it, but he could have said that and maybe allowed some of us to use it. But no. He’s a bit of a coward that way. FOOTNOTE ADDED APRIL 19th, 2017. Someone recently alleged to me that the whole production of “Medinah” is a front to finance ISIS. That the money goes from a Sheikh in Qatar to an off-shore account where ATG takes a cut and the rest is funnelled by ATG onto ISIS. This is a truly scary thought. I’ve been advised not to repeat this, but it needs to be said. If that is what was/is happening (personally, I doubt it), it needs investigating. ATG really needs to be put under the microscope.